See ingredients in bold. Store in a cool, dry place away from direct sunlight. Cheesy and meaty, these Exante Cheese & Bacon flavour Breakfast Eggs are a perfect choice for a healthy, hearty savoury breakfast or brunch. This box contains 7 cheese & bacon breakfast eggs. How to use Exante Cheese & Bacon Breakfast Eggs? The Exante Cheese & Bacon Breakfast Eggs can be used as part of an Exante plan for quick weight loss or as a meal replacement to complement a calorie-controlled diet. All Exante soups, shakes, bars and meals are enriched with over 22 vitamins and minerals and are high in protein and fibre. Eating three Exante products a day will provide you with 100% of your EU Recommended Intake (RI) for vitamins and minerals. Empty the packet into a bowl and add 80ml (2.7 fl.oz) of cold water. Stir well. Cook in a hot pan for 20-30 seconds or until scrambled. Skimmed Milk Powder, Maltodextrin, Whole Egg Powder (12.5%), Vegetable Fat Concentrate (Refined Soybean Oil, Maltodextrin, Milk Proteins, Emulsifier (Soy Lecithins)), Egg White Powder, Soy Protein, Inulin, Cheese Powder (Milk), Potassium Citrate, Flavour, Calcium Phosphate, Salt, Ground Black Pepper, Sodium Bicarbonate, Calcium Chloride, Magnesium Oxide, DI Potassium Phosphate, Vitamin Premix (Vitamin C, Maltodextrin, Iron, Vitamin E, Niacin, Vitamin A, Zinc, Copper, Fluoride, Chromium, Selenium, Manganese, Vitamin D3, Folic Acid, Potassium Iodide, Vitamin B6, Vitamin B5, Vitamin K, Thiamin, Biotin, Molybdenum, Riboflavin, Vitamin B12), Emulsifier (Xanthan Gum), Potassium Chloride. On their own I find these a bit bleh. I make mine as scrambled eggs as I'm not so keen when these are cooked as omelettes. I add fresh herbs and any or all of the following: chillies, chopped mushrooms, spinach, spring onion, sweet pepper, plus seasoning into the mixture before cooking. I also add about 20ml more water. I cook the scrambled eggs in a small non-stick frypan over medium heat with a l FryLight 1 cal squirted in shortly before adding the mixture, then I keep agitating them with a non-stick spatula otherwise they set in lumps. Take it off the heat when it not quite finished cooking and let it finish in the pan before turning out onto a plate. I usually have tomatoes, fresh or tinned, alongside. It makes a very tasty meal. This is awful tastes nothing like eggs anyway shape or form it tastes like artificial bacon yaw dough!! Awful awful!!! I quite like this breakfast/anytime replacement meal. 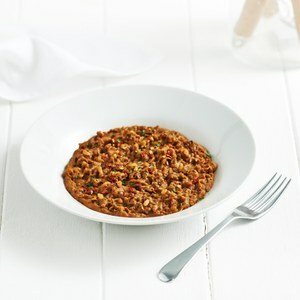 A little bland on their own, but add mushrooms or other low fat/calories items with a few herbs and they are excellent. I also successfully made a scrambled egg version on a low heat in a non-stick saucepan. I had forgotten the photo on line showed an omelette so was unsure as how to fry this product, as scrambled or a fried eggs? I ended up adding 1dl water, cooking as an omelette, low heat in teflon pan, covered last minutes for an amazing fluff. Taste: impressed! First meal I did not add herbs or spices to. Lovely, will reorder. I've had this before and it tasted lovely smelt of cheese and bacon so thought would have again as I needed something for breakfast. How disappointing when you open the packet it smells lovely but after cooking the smell disappears and tastes horrible and gritty have you changed the recipe? Shame. I read such glowing reviews on this product so decided to buy four packs. I have managed two with the addition of mild chilly sauce the second time but I am sorry to say that I find them inedible and have consigned the rest to the bin. They taste and smell awful and have a rubbery texture. Yum! Egg cheese and bacon pancakes are absolutely delicious. I enjoy them slowly eating them with my fingers. Yumm.